120 Vegetarian Ayurvedic Herbal Anti Oxidant Tablets Suitable for Men &Women Providing One Month Supply. Extra Potent Active Ingredients including Amla, False Daisy, Satavar, Indian Kudzu and Indian Ginseng. Helps to rejuvenate the texture and strength of hair and relieves and rejuvenates the scalp. 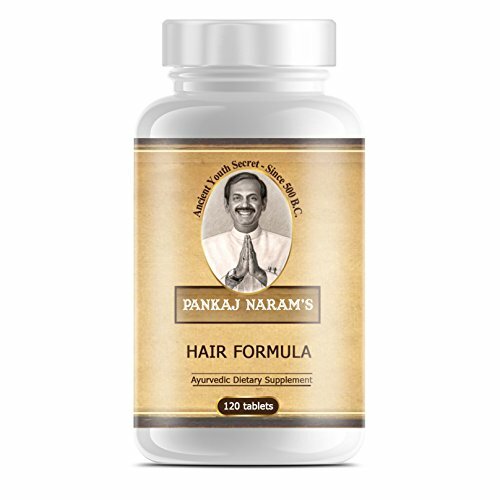 Pankaj Naram's Formula's Use Only the Highest Quality Fresh Herbs, Combined According To The Ancient Processes Given in Siddha Veda Scriptures, Dating Back To 2500+ Years Ago. Pankaj Naram's mission is to bring the benefits and secrets of the Ancient Ayurveda into every heart and every home on earth. Pankaj Naram has facilitated his expertise to many people including The Dalai Lama,Mother Teresa and Nelson Mandela. Promote Hair Texture and Strengt, Rejuvenates The Scalp The natural herbs and ingredients strengthen hair texture and rejuvenates the scalp. For better hair. Why Hair Formula Does Work Contains only natural & safe high quality ingredients according to ancient Ayurveda techniques. All tablets are vegetarian and vegan friendly. Ayur Veda Ayur Veda is a system of medicine with historical roots in the Indian Subcontinent. In the Western World, Ayurveda therapies have been integrated in general wellness applications. Get Your Month Supply Today! Add to basket now to benefit from our special introductory offer while stocks last!